Part 5: The Magic is Back! Part 3. I Gotta SPLIT! XAM! Part 4: Marvel's first Marvel! Studying history is funny. you may go all your life believing something you read once. Then someone will tell you something that explains an aspect of it you did not know. Then someone comes along and says something the blows everything you think you know out of the water. That's what happened to me with this story, and it seems very, very difficult to find two people who agree on it. As we have seen, the company now known as DC Comics sued Fawcett Publications, the creators of the original Captain Marvel, for copyright infringement. Long story short, Fawcett settled and shut down their comics division, including Captain Marvel and the entire extended Marvel Family. As a result of this, there was no reason for anyone to expect that the original Captain Marvel would ever be seen again. He would be confined to the realm of fond memories in fanzines like Fawcett Collectors of America and the occasional satire in publications like Mad magazine and Marvel's Not Brand Echh When Jules Feiffer wrote The Great Comic Book Heroes in 1965, the publisher's legal team determined that they could only print one page of the Captain Marvel's origin story without running afoul of the legal agreement between Fawcett and DC. But then, in 1972, DC announced that they would be reviving that great hero in the pages of his own comic. How could this happen? That depends on whose story you believe. 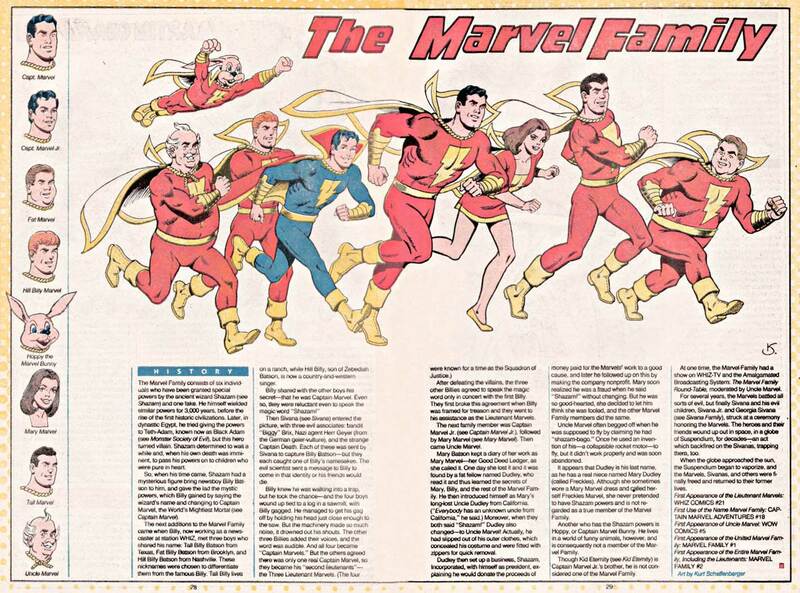 In DC's publications, the individual source of the decision to bring back the original Captain Marvel was never revealed. When I started researching the project, however, I had a chance to talk with Carmine Infantino, who was the publisher of DC Comics at the time (Carmine was a frequent guest of the Big Apple Comic Con, and I was working for that convention). Carmine told me that it was his idea. I asked him "did you just wake up one morning and decide to bring back Captain Marvel?" and he said that yes, he called Fawcett and asked what it would cost to get the rights, and that Fawcett said "Make us an offer." "Frankly, I think they were glad to get rid of him," he told me. This makes sense, as they couldn't make any money off of him any more. And so a deal was struck. And thus, that is how thought the story went. Through the Internet I was able to communicate with Mark Evanier. Mark was working with Jack Kirby at DC Comics in the early 1970's. He told me that he was present when Jack Kirby suggested to Carmine Infantino that DC revive the original Captain Marvel. The full story of how this suggestion came about and what developed will wait until another time, but long story short, DC contacted Fawcett and licensed the original character, restarting his story in a new comic book begun at the end of 1972. They even got C.C. Beck, chief artist for the Big Red Cheese back at Fawcett, to draw the new stories. Now is where the trouble begins. PAY ATTENTION! THIS IS THE MOST IMPORTANT PART OF THIS ENTIRE HISTORY AND WILL EXPLAIN ALL THE CONFUSION ABOUT THE "NAME THING!" As you may recall, Marvel Comics secured "Captain Marvel" as a trademark in the late 1960's. 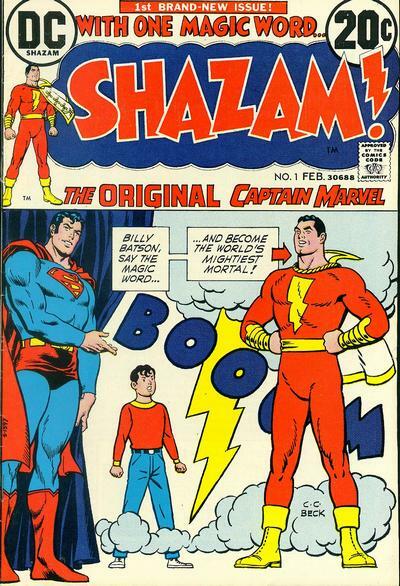 This meant that no other comic book company could produce a comic book with the title "Captain Marvel." So the smart folks at DC put their heads together and realized that since this comic would include all those characters who gained their powers from the old wizard, making the magic word that brought that power be the title might work. And perhaps they could even "pull a fast one" to sneak the hero's name on the cover! DC got away with this for a while (until issue #14, in fact) but the prevailing story nowadays is that Marvel sent a cease-and-desist letter to DC, telling them to stop that. It turns out that any appearance of Marvel's trademark on the cover of a comic, even if not the title itself, is a violation of that trademark. This title would be abbreviated to "SHAZAM!" (all caps, with the exclamation point) in the corner of the cover, in subscription solicitations, the TV show, T-shirts, and the packaging for action figures, T-shirts, toy cars, Halloween costumes, View-Master slides, and even Underoos. The World's Mightiest Mortal was even the first superhero introduced in the Hanna-Barbera's Legends of the Superheroes TV special on NBC in 1979. He was played by Garrett Craig, and two of his villains, Dr. Sivana (played by Howard Morris) and Aunt Minerva (played by Ruth Buzzi). DC Explained the 20-year absence of he Big Red Cheese and the Marvel Family by saying that they had all been gathered together for a special award ceremony, when Dr. Sivana trapped them all in sa globe of "suspendium," which would put them into suspended animation. But a mishap drove Sivana's ship into the globe, and both the heroes and the villains were trapped, frozen, for 20 years. Eventually they drifted closer to the sun which thawed everything out, and the heroes got everyone back to Earth safely. There was a brief attempt to play Billy Batson and Captain Marvel as "people out of their time," like Captain America, but that went away after two issues. They all fell back into the same routines that they had during the Fawcett years. DC even made a point of reviving every Marvel Family character they could over these years. C.C. Beck was disappointed with the quality of the stories and quit the book in less than a year. He was replaced by Kurt Schaffenberger (after a few fill-in jobs by Bob Oksner) who defined the look until 1979. From 1974 to 1977 Filmation produced a Saturday morning live-action TV show on CBS, with the hero, played at first by Jackson Bostwick, then later by John Davey, with Michael Gray as Billy Batson and Les Tremayne as "Mentor." They traveled the highways and byways of America helping people in need with a thoughtful moral lesson at the end of each episode. 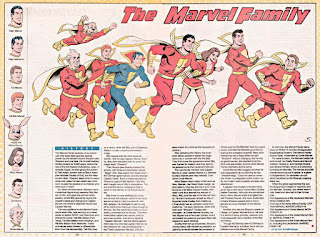 The series proved to be very popular (and this Captain Marvel is still the only comic book superhero to ever have a live-action Saturday morning TV show) and elements of the show were incorporated into the comics. Uncle Dudley (Uncle Marvel) adopted a leisure suit and grew a mustache (a la Tremayne), calling himself Billy's "mentor" as Billy's employer, Station WHIZ, have him a camper and sent him to tour America to celebrate the Bicentennial. In 1980 a SHAZAM! cartoon was a feature of the Kid Super Power Hour With SHAZAM! This was a Saturday morning TV show about a bunch of high-school-age superheroes-in-training, bumpered by live-action comedy skits and musical numbers by the superheroes. The cartoons were produced by Filmation and recycled the music from the SHAZAM! TV show (and a lot of the animated footage). 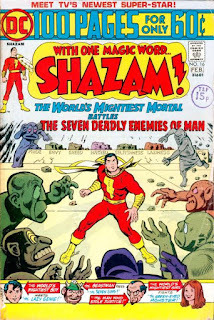 The look of the cartoon was surprisingly faithful to the original comics in style, and even adapted some stories from the comics, such as "The Return of Black Adam" from The Marvel Family #1 from 1945! Significantly, in this run of the hero, DC brought back Black Adam, a one-shot villain from that story in 1945. His alter-ego was Teth Adam, an Egyptian who had been given the power to transform into a mighty hero by the old wizard Shazam 5,000 years ago (Shazam was old then, too). His magic word/acronym used Egyptian gods. In 1978, there were changes in the works at DC. It was felt that the Schaffenberger style was not reaching the fans, so he was replaced as penciler of the book with Alan Weiss, inked by Joe Rubenstein, then the following issue with Don Newton, inked by Schaffenberger. This gave the comic a "dynamic new look." After issue #35, the book was cancelled and SHAZAM! continued as a feature in the "DC Dollar Comic" World's Finest, holding down the last eight pages of the book until 1982. 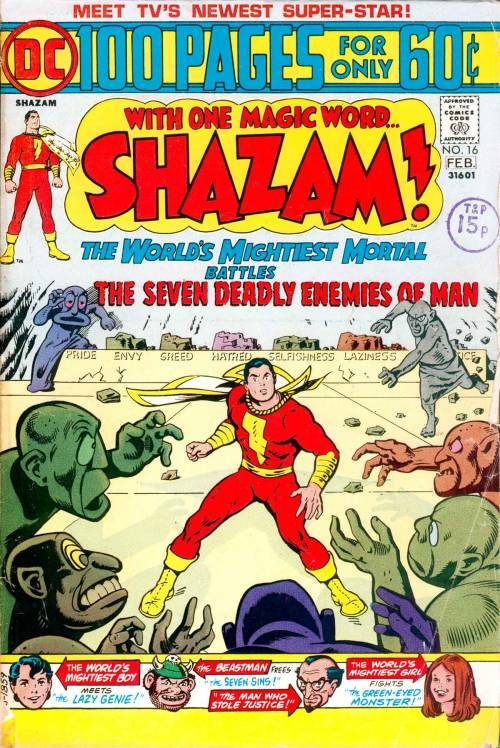 The tile would appear as a back-up story in Adventure Comics for a while and the "SHAZAM! Family" would guest-star in several issues of DC Comics Presents and All-Star Squadron until 1986. But first: Captain Marvel is Energy! - Next Post! MARVEL'S CAPTAIN MARVEL TRAILER LANDS! OR TAKES OFF! YOU DECIDE!